An invitation to Dan's birthday party was readily accepted. The likelihood of a buffet was an attraction as was the prospect of a band being booked for the occasion. On learning that the band would be none other than the Vieux Carré Jazzmen it fell to your correspondent to pen a review. Cullercoats Crescent Club's ground floor, sea view lounge filled up nicely - family, friends, liggers - as bar staff laid out a sumptuous buffet. Yes, a good decision to get along to wish Dan well then tuck in. But wait...first a beer. The Old Potting Shed's Legally Blonde from High Spen the pick, a glance at the buffet - YUM! - then to the jazz. Young Dan is in the prime of life and, as we would later hear, he'd been in the woodshed honing his skills harpin' on a riff. It would be stretching it a bit to suggest the Vieux Carré were in the first flush of youth, but the one thing they have in abundance is an enthusiasm for the music. 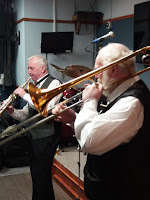 The McBriartys - Jim and Lawrence - formed the front line with the VCJ's rhythm makers - Messrs Bennett, Colledge and Thompson - occupying every last centimetre of the compact stage. From Earl Hines' My Monday Date (McBriarty, J, playing soprano) to Walkin' My Baby Back Home (McBriarty, J, singing) to Ballin' the Jack (singing drummer Fred Thompson singing) to a feature for McBriarty, L, that's 'bone man Lawrence, on Memories of You, this was typical Vieux Carré. MC Brian Bennett kept things moving along and before long some of Dan's guests would be up shaking their thing. Bye Bye Blackbird didn't get them onto the floor, nor Ida, Sweet as Apple Cider, these were tunes to sing along to. Talking of cider...another Legally Blonde, thank you. As the Vieux Carré went to the bar to sink a well-earned half of shandy, birthday boy Dan took centre stage. 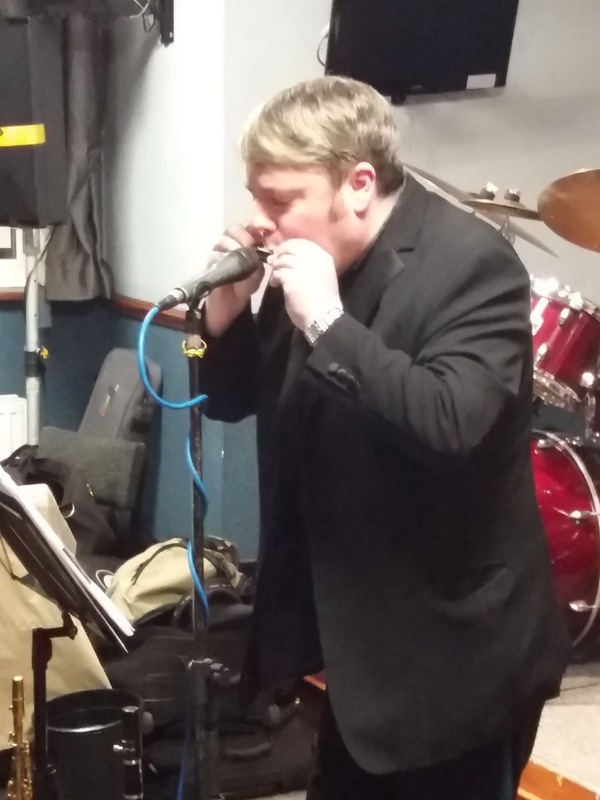 Harmonica in hand, Dan played and sang first Blaydon Races with vocal accompaniment from the room, then When the Saints (Go Marchin' In) with Dan's backing singers offering their full support. As if Dan's surprise performance wasn't enough, up stepped Mike Jamieson! 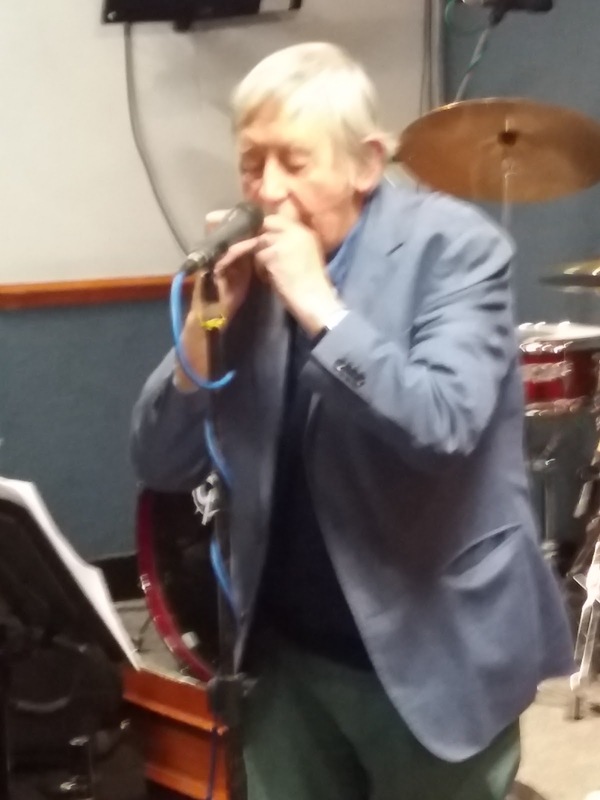 A man who knows his jazz and rhythm 'n' blues onions, Mike blew harp and hollered as if an American bluesman. You could hear Little Walter applauding from Blues Heaven as MJ really did hit on Blues with a Feeling and, as Mike observed, perhaps the sole blues number in praise of fidelity, My Babe. Between times, Rodrigo's Concierto de Aranjuez offered a nice contrast with Mike at pains to point out that he played this one on chromatic harp. A paper plate-full of buffet delights, a chat with Lawrence, playing this evening's gig hot foot from a week in Scarborough, then on to the second set. Irving Berlin's Always (Jim McBriarty singing), My Honey's Lovin' Arms (a first request of the evening) featuring McBriarty, vocals and soprano sax, taken at a jaunty tempo, then an oddity, by way of a second request...Ralph McTell's Streets of London. 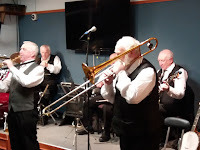 The Quintette du Hot Club de France put in an appearance with Rose Room then, all the way from Oz, courtesy of ex-pat Don Armstrong, Jack O'Hagan's Along the Road to Gundagai as sung by Peter Dawson, here at the Crescent club crooned by Jim McBriarty. Well, this was varied fayre and, following a short interval, the VCJ would return one more time. John Brumwell joined the party to enquire: Who's Sorry Now? Good value is Mr Brumwell, so much so he enticed a fair few onto the dance floor. MC Bennett complimented those brave enough to shake their thing, suggesting they were a throwback to Pan's People (check out Top of the Pops, kids). Quick as a flash, the self-deprecating lot that they were quipped: Pan's Pensioners! They said it! Singing drummer Fred Thompson crooned When the Midnight Choo-Choo Leaves for Alabam' and that was about it save for an ice cream...after all, we were down at the coast. To be precise, Ice Cream... all together now: I scream, you scream. 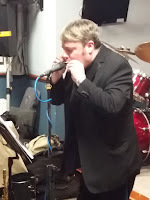 Just to explain: At was essentially a jazz event I played my harmonica version of the classical Concierto de Aranjuez because it was the basis and inspiration for the Mile Davis Sketches of Spain theme.